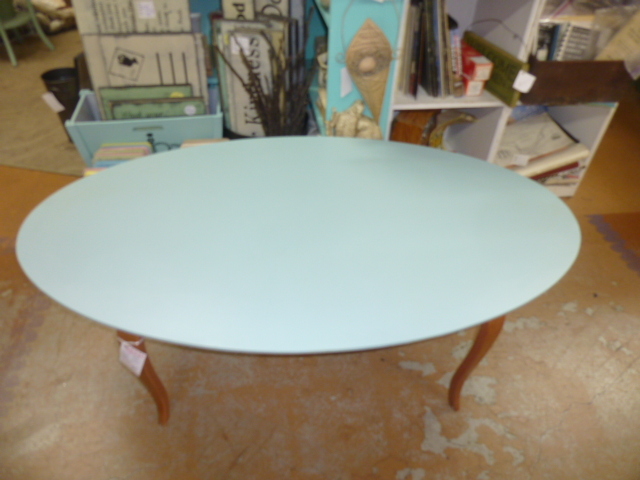 Just a few more aqua tables . . . Nothing new or different or exciting. 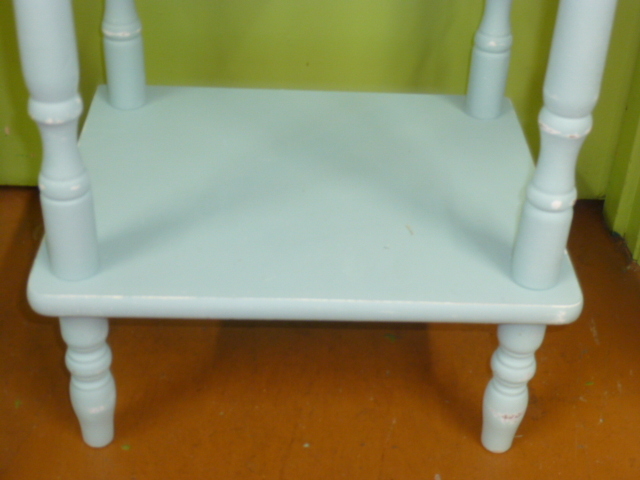 Just some more old tables that I repainted aqua. Same old, same old! But HEY! They SELL!! 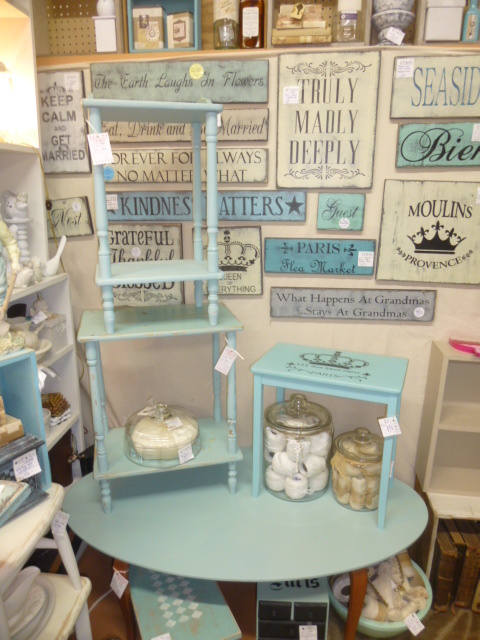 I can’t even count how many of this exact same style of tables I have done over the years! A very basic, simple style. One of those put it together yourself ‘kit’ tables. The top had a fair amount of warping from water damage. I suppose I could have spent HOURS sanding it to a perfectly flat surface. But the more time I spend on a project, the more I have to charge for it. Sometimes it’s worth the ‘investment’ (of time and effort); sometimes not. In this case it was not. 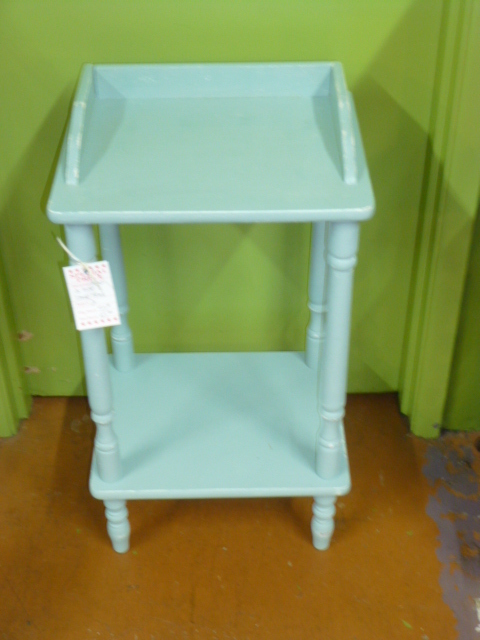 You just can’t charge that much for a little table like this. 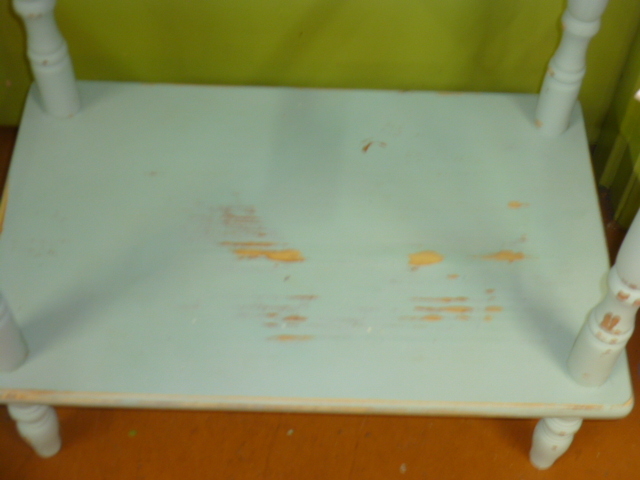 So I ‘worked with’ the flaws and distressed the rest of the table accordingly. 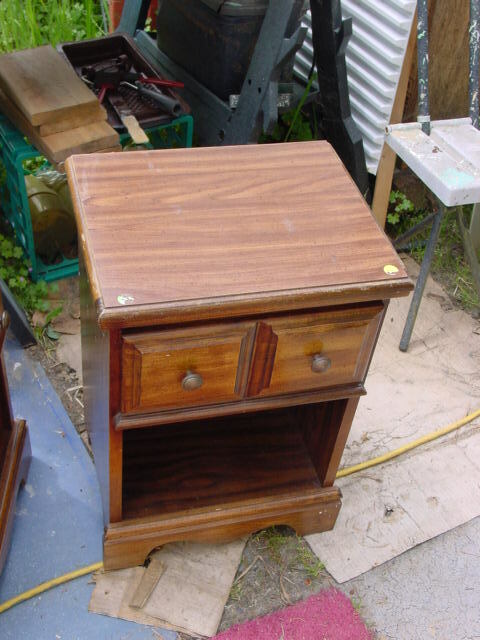 Very similar to the previous one, but not water damaged; and this one had been base-coated (POORLY so! very splotchy) with white. I thought about continuing with the white, but then I remembered how many times in the past I have had to haul white pieces back home from my booth, to repaint aqua, because they didn’t sell! Just a few bits of distressing on this one as I didn’t want a lot of the white to show through. 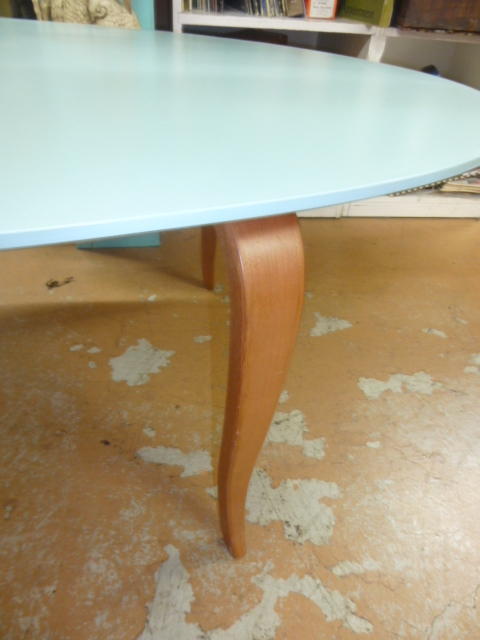 BIG, oval Danish style coffee table with lovely curved legs, but quite a scratched up top. I was dealing with ‘weather issues’ when I painted these three pieces. It turned really DAMP out overnight and I found them COVERED with stuck on gnats the next morning!!! ACK!! And the paint was WETTER than the day before. Had to wipe off the first layer of paint and finish painting them inside the house. Turned the washer/dryer into a make-do painting station. 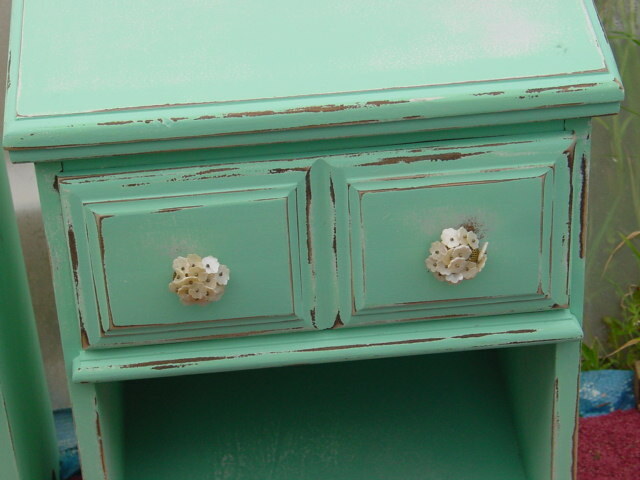 I REALLY got behind on my furniture painting last summer because it was SO dang hot outside!! I just can’t handle working outside in over 90 degree temps; which we had for MOST of the summer. Hottest summer on record for Oregon, I think they had said. Consequently, no really BIG furniture pieces for me this year. sigh. Oh well, the small ones always sell better. 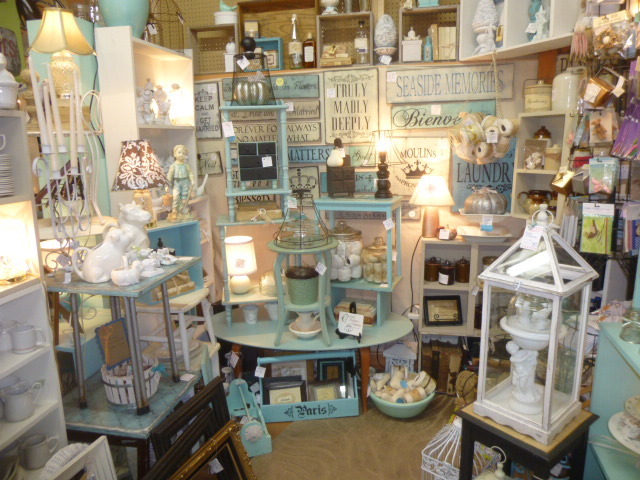 But the big pieces LOOK so fabulous in my booth! 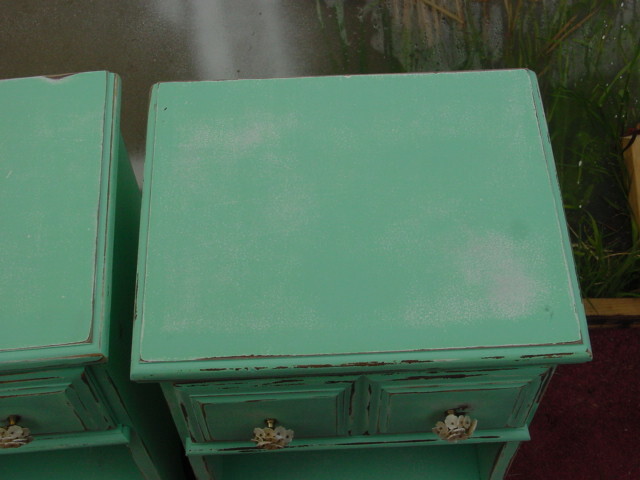 All three of these tables have gone to my booth at Stars Antique Mall in Portland. 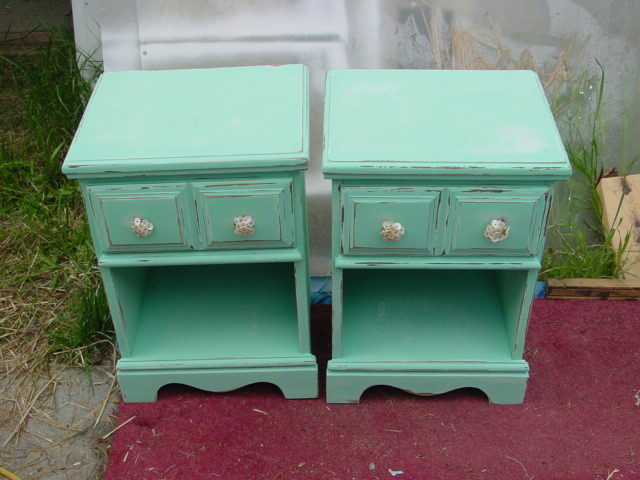 Bought this PAIR of night stands at the thrift store. The only BAD thing is that the top is FORMICA. They were in GREAT shape though, so I grabbed them; figuring I could always PAPER the top if painting didn’t work. 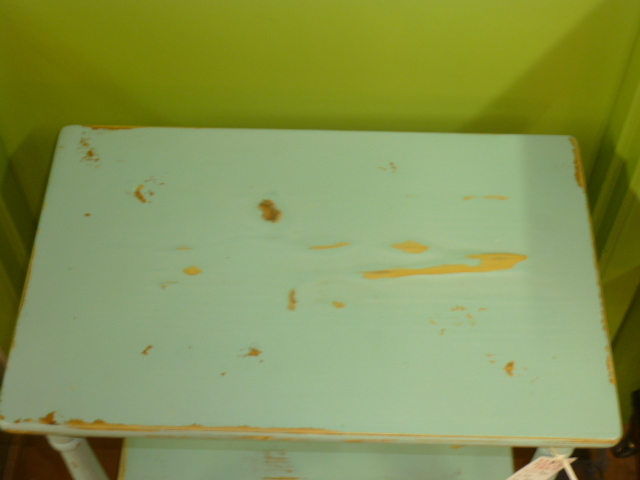 I used my trusty orbital sander to sand all over, INCLUDING that formica top. Then primed all over with KILZ (brush on kind). 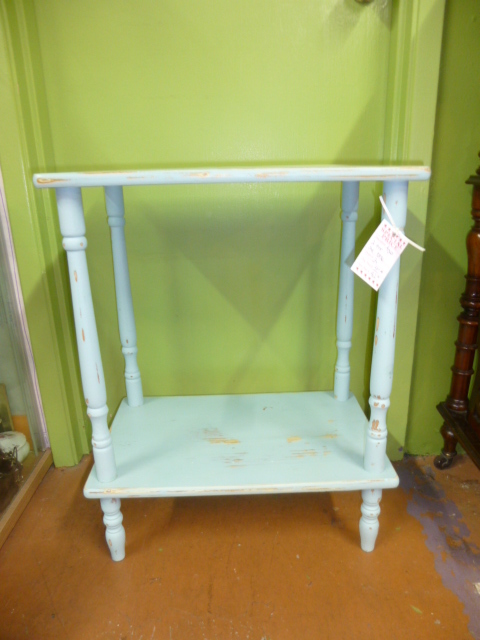 Then my favorite beachy blue paint! 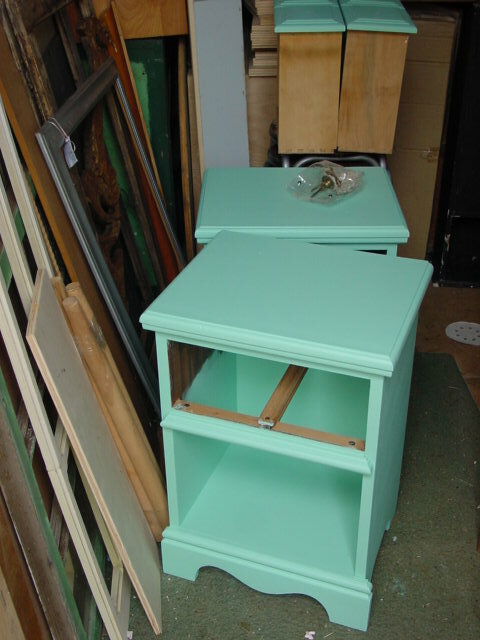 Time to tackle those formica tops! I sanded them with my orbital sander again. And while I only sanded through the top coat of paint to the white primer; with the dark wood EDGES showing through I thought it looked just fine. How much of the top is really going to even be SEEN once it’s in use anyhow? They look like little hydrangeas! I found them at Marshall’s. A couple of the little ‘flowers’ are missing, but I still love these knobs. And I figure if a customer doesn’t like them, it’s an easy enough thing to change out. SO, it looks like you CAN paint and distress a formica top; to an extent at least! These will be going to my space at Stars very soon.